Two Cairn Terriers showing variations in coat color. Abundant shaggy outer coat, soft downy undercoat. Can be cream, deep red, brindle, light gray, apricot or black. The Cairn Terrier is one of the oldest terrier breeds, originating in the Scottish Highlands and recognized as one of Scotland's earliest working dogs. 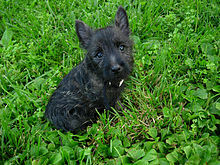 The breed was given the name Cairn, because the breed's function was to hunt and chase quarry between the cairns in the Scottish highlands. Although the breed had existed long before, the name 'Cairn Terrier' was a compromise suggestion after the breed was originally brought to official shows in the United Kingdom in 1909 under the name Short-haired Skye terriers. This name was not acceptable to The Kennel Club due to opposition from Skye Terrier breeders, and the name 'Cairn Terrier' was suggested as an alternative. They are usually left-pawed, which has been shown in dogs to correlate to superior performance in tasks related to scent. Cairn terriers are ratters. Cairns originated in the Highlands of Scotland and the Isle of Skye, initially grouped in the "Skye Terrier" class alongside the Scottish and West Highland White terriers. In the early 1900s, the three breeds began to be bred separately. The Kennel Club of the United Kingdom gave the Cairn Terrier a separate register in 1912; the first year of recognition, 134 were registered and it was in that year that the breed was also given Championship status. The Cairn Terrier has a harsh weather-resistant outer coat that can be black, cream, wheaten, red, sandy, gray, or brindled in any of these colors. Pure black, black and tan, and white are not permitted by many kennel clubs. While registration of white Cairns was once permitted, after 1917, the American Kennel Club required them to be registered as West Highland White Terriers. A notable characteristic of Cairns is that brindled Cairns frequently change colour throughout their lifetimes. It is not uncommon for a brindled Cairn to become progressively more black or silver as it ages. The Cairn is double-coated, with a soft, dense undercoat and a harsh outer coat. A well-groomed Cairn has a rough-and-ready appearance, free of artifice or exaggeration. The Cairn Terrier was registered into the American Kennel Club in 1903. Cairn terriers tend to look similar to a Norwich Terrier, but with some differences (for example the shaggy fur). Their outer layer of fur is shaggy, but they have a soft, downy undercoat. Their ideal weight is also 4.5-7.3 kg (10-16 lb), and the height 9–13 in (23–33 cm). Cairn terriers shed very little, but should always be hand stripped. Using scissors or shears can ruin the dog's rugged outer coat after one grooming. Hand stripping involves pulling the old dead hair out by the roots. If done incorrectly, this can cause discomfort to the dog, causing it to shy away from future hand stripping. Removing the dead hair in this manner allows new growth to come in. This new growth helps protect the dog from water and dirt. Cairn terrier ancestors are from Scotland, where the wire coat repels water and keeps the dog dry even in rainy or damp climates. Keeping the Cairn terrier coat in its original state will prevent possible skin irritations. As dead hair is removed by stripping the coat, new growth comes in and the skin and coat remain healthy. Clipper-cutting a Cairn might destroy the protective wire coat unique to this breed. It is wise to have a pet examined to rule out heritable skin diseases if a Cairn is obtained from unknown sources (i.e. pet stores, rescues, or puppy mills). These dogs are generally healthy and live on average about 12 to 17 years. Breeders, owners, and veterinarians have identified several health problems that are significant for Cairns. Some of these diseases are hereditary, while others occur as a result of nonspecific factors (i.e. infections, toxins, injuries, or advanced age). Currently, the Cairn Terrier Club of America, along with the Institute for Genetic Disease Control in Animals, maintains an open registry for Cairn terriers in hopes of reducing the occurrence of hereditary diseases within the breed. Breeders voluntarily submit their dogs' test results for research purposes, as well as for use by individuals who seek to make sound breeding decisions. Cairn terriers exist happily in an apartment if sufficiently exercised. They are very active indoors and suffice even without a yard. Daily walks help keep Cairn terriers happy and healthy. Fenced-in yards are strongly recommended for safety and well being as well as being kept on leash when not in the yard. Cairn terriers are particularly easily trained; ethical breeders strongly suggest obedience school or some other type of training to direct Cairn terrier's focus on the owner as the one in command if they are going to be used for hunting. If allowed to take control of the household, behavior problems may develop that can only be resolved by hiring a professional dog trainer. Many breeders only sell puppies to dedicated dog owners who agree to basic obedience school. Cairns are active dogs, thus need a daily walk. Play takes care of a lot of their exercise needs; however, as with all breeds, play will not fulfill their primal instinct to walk. Dogs which do not get to go on daily walks are more likely to display behavior problems. They also enjoy a good romp in a safe open area off leash, such as a large fenced yard. According to Temple Grandin in her book Animals Make Us Human, dogs need 45 minutes to one hour per day of playing and seeking. Being a new owner of one, play time is more like 2 hours a day for this feisty lovable little breed. After fulfilling this, dogs become balanced and well-mannered. Obedience school is often a good start to creating interactive play using words or commands for a dog to perform specific actions on cue. Teaching a Cairn terrier tricks is also a clever way to direct their active energy into acceptable controlled dog games. Terry, the dog that played Toto in the 1939 screen adaptation of The Wizard of Oz, was a brindle Cairn terrier. Due to the identification of the State of Kansas with the original story The Wonderful Wizard of Oz, a resident of Wichita has begun a drive to make the Cairn terrier the official dog of Kansas. Terry also had a role in the Shirley Temple film Bright Eyes, and 12 other films. In I Love Lucy, Little Ricky had a Cairn terrier named Fred. In Pal Joey, the character played by Frank Sinatra had a Cairn terrier named Snuffy. Snuffy was played by a dog named Danny; Danny also starred as Fred, the Ricardo's dog referenced above. J. Edgar Hoover notably bred Cairn terriers and gifted them to high ranking government officials during his career. UK TV presenter Paul O'Grady often features a Cairn terrier called Olga on his primetime chat show; dark in colour, Olga is a rescue dog. Also in the UK, Pauline Fowler actress Wendy Richard in the BBC TV show EastEnders had a Cairn she fondly named Betty. Betty made an appearance as Toto on BBC's "Strictly Come Dancing" (series 10) after Vincent Simone and his celebrity partner Dani Harmer danced a waltz to "Over the Rainbow" from The Wizard of Oz. George Lopez's family dog on the ABC TV series George Lopez, is a Cairn terrier named Mr. Needles, named by the son, Max, for the extremely high number of shots that the incredibly sick former stray received from the veterinarian. Australian television soap series Neighbours had a Cairn terrier named Audrey which belonged to the character Libby Kennedy. The character of Romulus, owned by Ray Milland's character, Steven Tolliver, in Cecil B. De Mille's epic Reap the Wild Wind (1942) was a Cairn terrier. A few years later, in The Uninvited (1944), the Ray Milland character also had a Cairn terrier. Thimble the dog was a brindle Cairn terrier played by Danvers. Thimble appeared once in episode five, season five of the British television drama Upstairs, Downstairs. A wheaten Cairn Terrier named Kobe was featured in Dunston Checks In, Lost And Found, and the opening scenes of Twister. In USA Network's Mr. Robot, Rami Malek's character Elliot Alderson has a Cairn terrier named Flipper. In the film Kingsman: The Secret Service, the character Harry Hart owned a Cairn terrier named Mr. Pickle. In the sequel Kingsman: The Golden Circle, Eggsy uses a similar Cairn terrier puppy to trigger Hart's memories after he suffered amnesia. In the TV show Dennis the Menace (1959 TV series), the character of Mr. Wilson owned a Cairn terrier named Fremont. In the Maximum Ride book series, Total, the talking dog, is a Cairn terrier. In the first edition of L. Frank Baum's book The Wonderful Wizard of Oz (1899), though Baum did not specify in the text what breed Toto was, illustrator W. W. Denslow drew him as a Cairn Terrier. In Donald Barthelme’s short story "Chablis," the narrator says that his baby wants, according to his wife, a "Cairn Terrier." ^ "Cairn Terrier History". American Kennel Club. Retrieved 26 October 2014. ^ "swwectc- cairn history". www.swwectc.freeuk.com. Retrieved 2016-11-26. ^ "Individual Breed Results for Purebred Dog Health Survey". ^ "Health Related Concerns". Cairn Terrier Club of America Inc. Retrieved 12 May 2010. ^ Alex., Gough (2004). Breed predispositions to disease in dogs and cats. Thomas, Alison, 1964-. Oxford, UK: Blackwell Pub. ISBN 978-1405107488. OCLC 53231203. ^ "Wichita resident wants 'Toto' breed named state dog of Kansas". Lawrence Journal-World & 6 News. 13 May 2006. Retrieved 12 May 2005. ^ "Portrait of a Lady". ^ Kilkelly, Daniel (17 August 2011). "'Neighbours' pet dog Audrey loses cancer battle". Digital Spy. Retrieved 7 January 2014. ^ "'Mr. Robot': Rami Malek Reveals What's Next... for Flipper". Retrieved 28 November 2015. ^ Barthelme, Donald. "Chablis." Forty Stories. New York: Penguin Books, 1989. 1. Print. 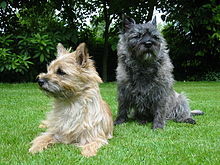 Wikimedia Commons has media related to Cairn Terrier. This page was last edited on 12 April 2019, at 18:45 (UTC).